IPS Roofing Limited are proud to have negotiated this contract with NL3, now known as Edge Property Solutions. The Main Roof has been installed with Rubberfuse TPO Single Ply Membrane faced 71mm core Kingspan KS1000TD Topdek, installed on to a new purlin system. 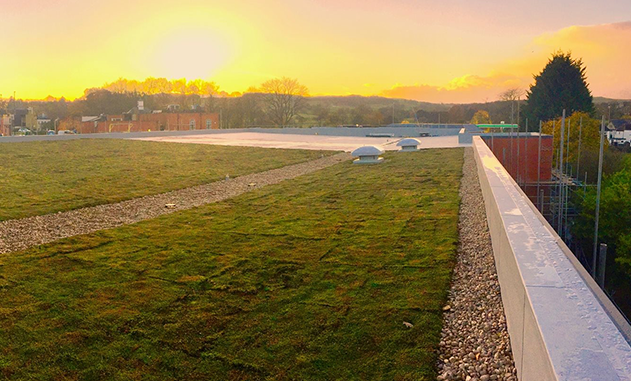 This roof is complimented with a Sedum Roof which adds to the building both aesthetically and boosting the environmental credentials of the building. The Parapet Upstands are installed in a contrasting Rubberfuse ST Dark Grey Membrane over 50mm Kingspan TR27 Insulation, all finished with Rubberfuse SLM Dark Grey trim. The Canopy Roof is Rubberfuse FB 1.2mm Light Grey Membrane fully adhered to 18mm Ply Wood that is mechanically fixed to new purlins. The Perimeter detail is complete with Rubberfuse SLM Gutter in Light Grey with Aluminium Fascia & Soffits. A QBM Soter Fall Restraint System has been installed, with all posts weathered with Rubberfuse TPO Membrane. This system gives Aldi peace of mind that maintenance can be carried out safely at all times. The SITA DSS drainage system was chosen for on this particular project, for its high drainage capacity, with minimal pressure drop and excellent processing abilities.